I have spent some time putting this short e-book together. 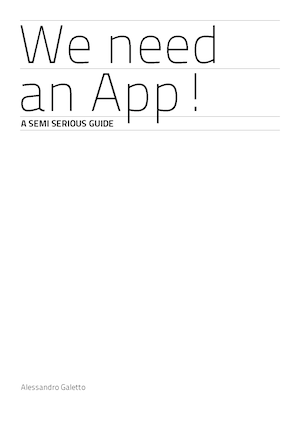 Are you sure you need an app? Before you jump on the app bandwagon, read these clever guidelines for senior managers preparing to build apps. Author Alessandro Galetto built his career developing exciting mobile apps and shares that experience with you in these practical guidelines. • focus on what’s important. Nobody’s got the recipe for a perfect mobile app, but this simple list will help you address your needs—and your customer’s desires—when you design one. I have been waiting too long to release this, and it’s time to move on. A big thank you to Kristy Lin Billuni for reviewing the text and correcting my English! Thanks to Roberta Tassi for the pagination and the creative work! Great job, Roberta. You rock!